Born in Crevalcore (BO) in 1970. Laurea (1995) and Ph.D (2000) in Chemistry at the University of Padova (supervisor Umberto Tonellato). Post-doc at the University of Toronto in the group of Jik Chin (2001-2002). In 1999 he was appointed as Assistant Professor of Organic Chemistry by the Department of Chemistry of the University of Padova, where he later become Associate Professor (2010) and finally Full Professor (2016). 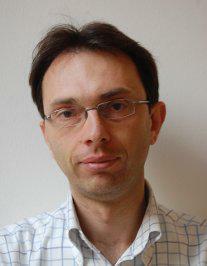 In 2014 he was awarded with the “Research Prize for Molecular Interactions” from the Italian Chemical Society (SCI). Since academic year 2000-2001 he has been teaching several Organic Chemistry courses for the Degrees in Chemistry, Industrial Chemistry, Materials Sciences and Molecular Biology. At the moment he teaches Organic Chemistry II for the degree in Material Science and Laboratory of Organic Chemistry II for the degree in Chemistry. In academic years 2010-2015 held the courses of Nanobiotechnology and Nanosystems for the Degree in Industrial Biotechnology. Actually he is teaching the the course of Supramolecular Chemistry for the Degree in Chemistry. He received a University of Padova Young Researchers Grant in 2003 ("Artificial Nucleases"), a University of Padova Research Grant ("New optical sensors, based on the molecular self-organization and on the properties of nanosystems, for the detection of metal ions in solution") in 2004-2005, a research contract on the "Synthesis of nanoparticles for toxicity investigations" from Veneto Nanotech in 2008-2009, an ERC Starting Grant ("MOSAIC: Patterning the surface of monolayer-protected nanoparticles to obtain intelligent nanodevices") in 2010, an ERC Proof of Concept Grant (INSIGHT: New chemical detection methods based on NMR and nanoparticles) in 2015. His research interest is focused on supramolecular and nanochemistry, with particular interest in the exploitation of self-organization as strategy to design and realize chemical systems capable to perform complex functions. These include catalysis of hydrolytic reactions (in particular artificial metallonucleases), fluorescence and NMR-based chemosensors, and biomedical applications. He is co-author of about 80 scientific papers published in peer-reviewed journals, 5 book chapters and two patent applications. His current h-index is 30.